The price action in SPY showed some real strength in that it gapped up, never filled, and closed above the open. When the market is coming off an oversold level in an uptrend and is still not overbought, this pattern will often be followed by further gains. This was shown in the subscriber letter last night (click here for a free trial). And in the 5/22/12 letter I also showed that when the SPY pattern occurs following a short-term low it appears to provide a bullish edge, but when it occurs after an intermediate-term low then the bullish inclinations no longer hold true. The current setup is bullish and I have updated the stats below. The reliability and the size of the moves are both impressive. This study suggests the rough start this morning is likely to be overcome in the next few days. The International Traders Expo is going to be at Caesar's Palace from November 14-17, 2012. I've been to this expo a couple of other times and have really enjoyed it. I'm pleased to announce I'll be back this year and giving a presentation on Saturday the 17th from 1:15pm - 2:15pm. The topic of my presentation will be "Overnight Edges - A Quantitative Look at Overnight Market Movements and Opportunities". I'll be covering a lot of my newest and most compelling research with regards to the overnight market. For more information and to register for the expo (free), click here. I hope to get the opportunity to meet many readers and subscribers at the Expo. But none of this tells the whole story. 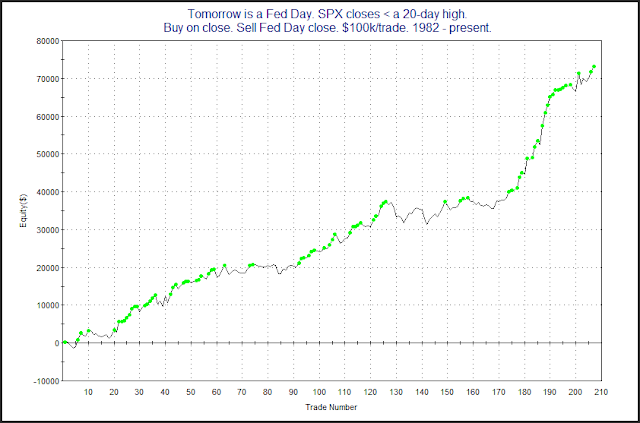 For a more detailed breakdown of overnight vs. day gains I would suggest checking out the Overnight Edges TurnaroundTuesday study. Results there are quite intriguing. Last year I showed that the week following September options expiration has historically been the most bearish week of the year. 2011 didn't do anything to make the stats look any more bullish. Below is an updated chart showing the persistently poor performance since 1961. 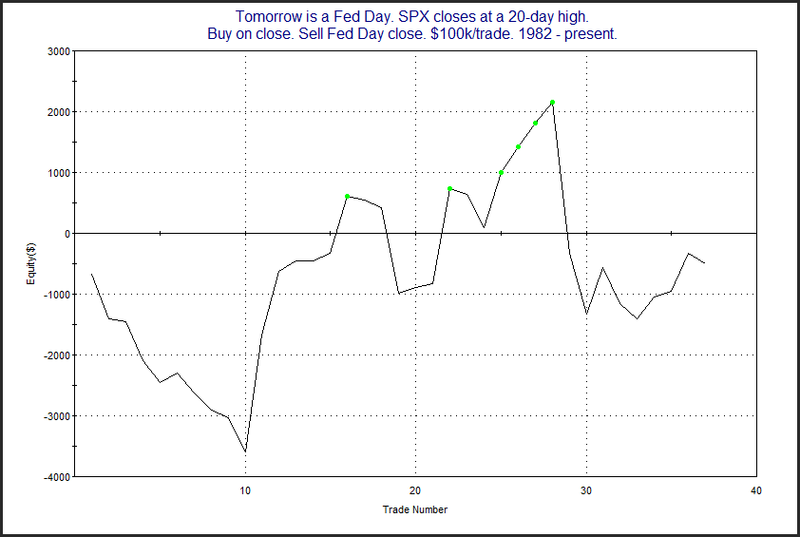 One variable I showed in January was whether the market was already at an intermediate-term high. 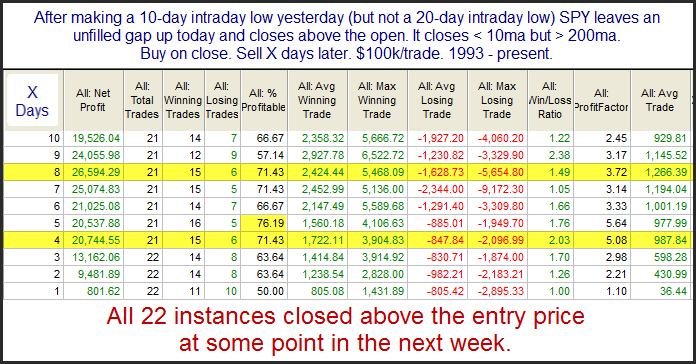 There is a decent chance the market closes at a new high today so I've decided to update that study. That’s basically 30 ½ years of bullishness. No consistency and no pronounced edge in this sample of 37 instances. Also, for more updated Fed Day research be sure to check out today's Overnight Overview at Overnight Edges. The size of the follow-through isn't terribly large. But it has been very, very consistent that at least some follow through was achieved in the next few days. In the 7/19/12 blog I looked at the short-term importance of an unfilled upside gap accompanying a breakout. With yesterday’s breakout occurring along with an unfilled up gapI have revisited that study below. 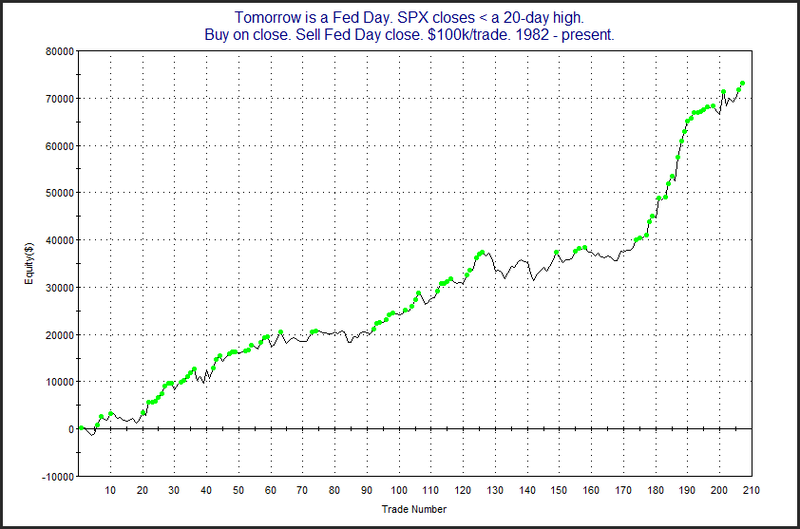 Now let’s look at instances where the 50-day high breakout was not accompanied by an unfilled gap. Interestingly, the number of instances was nearly the same. This study also appeared in the 7/19/12 blog and is updated. 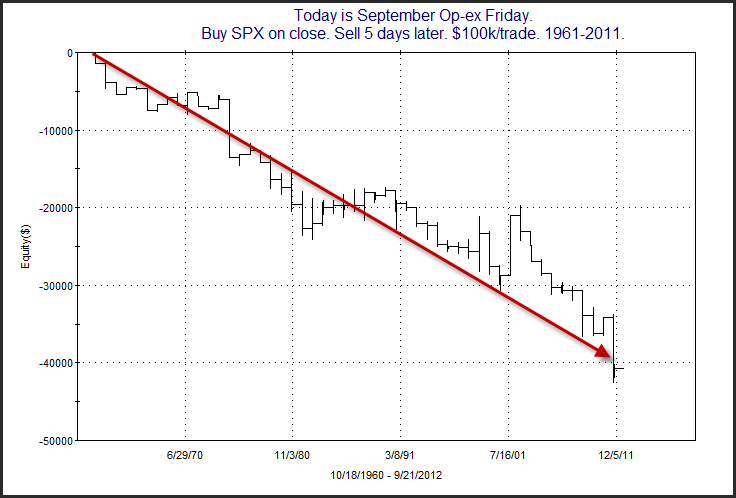 Last night in the Quantifiable Edges Subscriber Letter I examined short-term implications of strong 1-day rises in the Russell 2000 (RUT) while the S&P 500 (SPX) declined. I found that there appeared to be a decent upside inclination for the following day. This morning I played around with this concept a little further, added a filter that eliminated instances occurring in conjunction with intermediate-term lows, and ran the test out longer. What I found was quite interesting and can be seen in the stats table below. While 1-day implications appear bullish, looking out over the next couple of weeks there has been a strong downward tendency. This may be worth keeping in mind over the next 10 days or so.